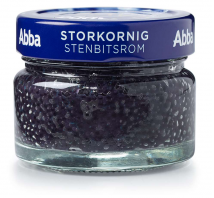 Spawn that was initially created to imitate the famous Russian black caviar. Now this spawn has gained the role of a classic decoration. It will supplement egg dishes, sauces and serve as a side dish. 100 g of product contains: energetic value – 370 kJ (90 kcal); 4 g fat (from which 0.9 g saturated fat acids); 2 g carbohydrates (from which 0 g sugar); 11 g proteins; 4.9 g salt.